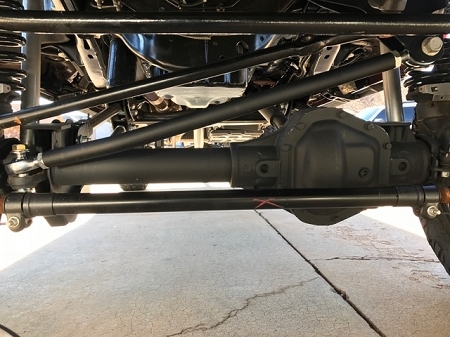 For trucks with leveling kits and lifts alike, this adjustable trackbar will recenter your axle and give you tighter steering response. This is a direct plug and play setup. This heavy duty trackbar is constructed from 1.5" OD .250+ wall DOM with an oversized 1" FK heim joint. All lower adapting spacers are machined from 4130 chromoly for increased strength and security. WE STRIVE TO OFFER THE HIGHEST QUALITY COMPONENTS AVAILABLE ON THE MARKET! DUE TO RARE CONCERNS OF PREMATURE WEAR/NOISES, AS OF 8/31/17 WE HAVE UPGRADED THIS PRODUCT TO FK ROD ENDS!! THESE ARE CONSIDERED BY ALL TO BE THE HIGHEST QUALITY, AMERICAN MADE ROD ENDS IN THE INDUSTRY!! I had a terrible death wobble on my 2017 F250 as well as a ton of play in the steering. This trac bar solved both issues as soon as I installed it. Easy install if you know what you’re doing. Drives better than stock now, I’ll always use PMF parts on my trucks.